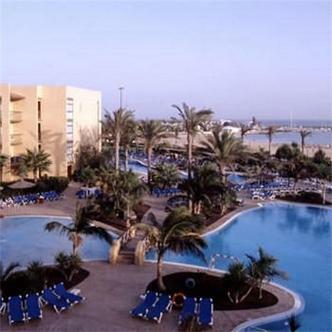 The Hotel Barcelo Fuerteventura is set right on the beach of Caleta De Fuste. It is 13km from the capital, Puerto Del Rosario and 7km from the new Fuerteventura International Airport. It's convenient proximity to the capital and the airport gives the hotel not only the characteristics of a beach holiday hotel but also a clear advantage in the role of an urban hotel serving this capital and airport.